[UPDATE]: Nintendo of America president Reggie Fils-Aime confirmed the February 13 release date for North America and Europe in a Nintendo Direct presentation today. The New 3DS XL will run $199.99 in the US and be available in red and black basic versions, a bundle packaged with a Monster Hunter 4 Ultimate-branded system and a copy of the Capcom action game, or a gold Legend of Zelda: Majora's Mask version of the hardware sold separately from the game. Fils-Aime also confirmed that the system will not include an AC adapter for charging the battery. However, AC adapters from DSi or previous 3DS systems will work with the new handheld. A leaked poster from US retailer GameStop appears to have leaked the US street date for the new 3DS, indicating that the machine will be available to buy from February 13. An image of the promotional material was uploaded to gaming forum NeoGaf, attributed to user Megauap. 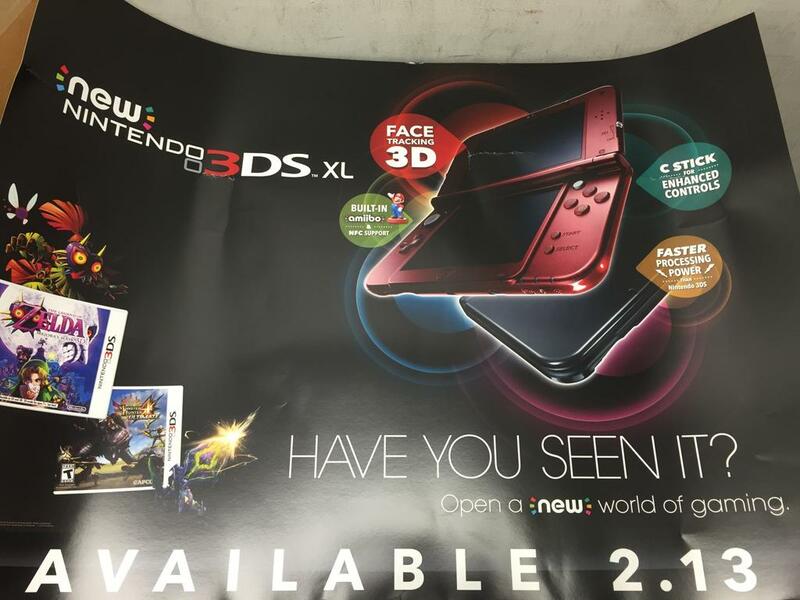 The poster shows the itself and key releases Majora's Mask and Monster Hunter 4 with the tagline "Available 2.13". The leak comes ahead of today's Nintendo Direct, scheduled for 2pm GMT, where more details of the machine's launch are expected to be made public, alongside those of Majora's Mask and Monster Hunter. Whether NeoGaf has stolen the publisher's thunder remains to be confirmed, but Nintendo has been contacted for further details. The handheld is another step in Nintendo's ongoing process of iterative improvements to the device, adding new shoulder buttons, an in-built 'nubbin' analogue stick, better 3D and improved processing power. Last week a limited number of "Ambassador Editions" of the model were made available to some journalists and fans, with that special edition thought to be made available to the general public at a premium price at a later date. "Does not include a powerpack/ charger. " Can anyone think of any other portable device sold (brand new) without any charging device? That is such a backwards mentality (remember how their GB Advance had a non-standard headphone jack that you had to buy a separate adaptor for?) and genuinely offensive to consumers. For shame. I agree, that happened when I bought my original 3DS XL, it is as bad a getting a toy at Christmas and not having any batteries. it wouldn't be so bad if the charging connector was USB, however it is their own proprietary type. I'm looking forward to Monster Hunter 4. Fils-Aime also confirmed that the system will not include an AC adapter for charging the battery. Thats like buying a new console that doesn't include a power brick, making you buy it seperately. And on top of that the price isn't even cheaper than the current model, it's the same price. Nintendo is needlessly being cheap. How many of you guys own a DSi, DSi XL, 3DS, 3DS XL or 2DS? Answer yes, you already own an AC adapter. The 3DS XL was released in Japan and Europe without the AC adapter back in 2012 and the New 3DS and 3DS XL in Japan last year with little issue. The new 3ds is backwards compatible, so most people probably wouldn't keep their original. If you give away your original and keep the charger, then the person receiving will need to buy one. The charger is the online pass of hardware, only you don't get the charger with the 3ds like we did with online passes and games. Even the iphone comes with a plug. and that has a standardised connector (USB) and pretty much has to be connected to a PC or MAc to be useable. Funnily enough, I was looking at getting a 3DS XL for my son who would be new to the 3DS but I don't like that I have to buy a, new, likely over priced charger. Even if I was an existing owner migrating, I would not like that I have to use my 'old' plug on my new device. I like new stuff with my new stuff :) and if it ends up I have an extra 'spare' one then great - one for work one for home. It's just Ninty being cheap where it doesn't and shouldn't need to be and ultimately, again, it's the consumer/ fan who pays.